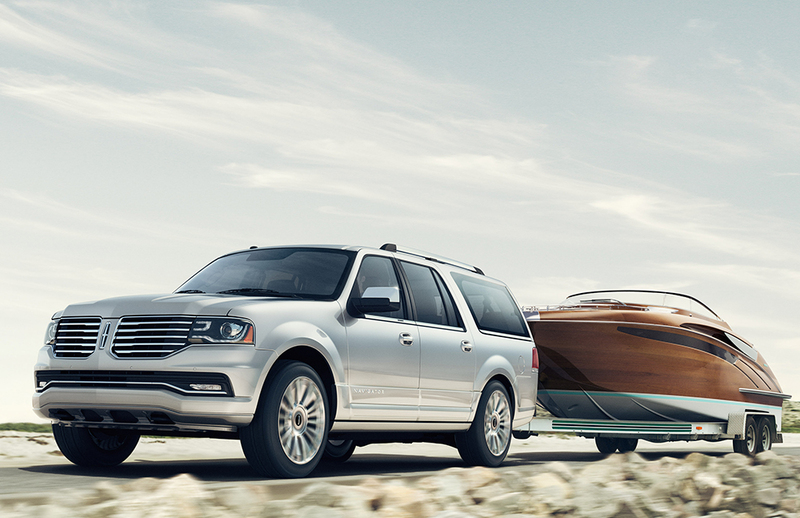 Properly equipped, the Navigator offers best-in-class towing capacity of 9,000 pounds. Ford reaches into its EcoBoost bag of tricks to freshen the full-size Lincoln Navigator. For 2015, Ford replaces last year’s eight-cylinder engine with a thriftier and more powerful twin-turbocharged six. The new Navigator receives exterior updates, a redesigned interior and updated cabin technology. The new Navigator also receives exterior updates, a redesigned interior and updated cabin technology. A new electric power assisted steering system and an available adaptive suspension improve handling. The Navigator is available in two wheelbase lengths – standard (119.0 inches) and extended (131.0 inches). With second-row captains chairs, both editions seat seven. An optional second-row bench boosts seating to eight. It’s not the usual eight-in-a-pinch, either; eight adults can get downright comfy in here. The new 3.5-liter V-6 engine delivers more horsepower (380 vs 310) and torque (460 pound-feet vs. 365) than last year’s V-8, and boosts economy by 2 MPG. Rear-drive models earn EPA ratings of 18 mpg combined/16 mpg city/22 mpg highway; AWD models are rated at 17/15/20. Thrift notwithstanding, performance improves significantly. Lincoln says the new Nav is 2 seconds quicker from 0-60. Independent testers report that AWD Navigators sprint from 0-60 in 6.7 seconds, and that 2WDs are a half-second quicker. Navigator retains its 1,570-pound payload and massive tow capacity. A properly equipped 2WD Navigator can tow up to 9,000-pounds; AWD drops that to 8,600 pounds. An available 4.10:1 rear axle helps multiply torque for maximum acceleration and low-end pulling power, with an accompanying drop in mileage. A six-speed automatic transmission and rear-wheel drive are standard. The available light-duty four-wheel-drive system compensates for the absence of low-range gearing with Hill Descent Control (HDC). Using HDC, the driver sets a desired speed, which the system matches and holds. Anyone who’s towed a trailer down a steep and slippery slope understands this feature’s worth. Outside, there’s a new hood/grille assembly and a power liftgate. Up front, LED accents surround a pair high-intensity discharge adaptive headlights. All told, the new Navigator wears 222 bright and sparkly LEDs. Inside, the feel is warm and pristine, with acres of leather trim and, in upper trims, rich wood accents. A large touchscreen offers access to the Sync connectivity and MyLincoln Touch infotainment and climate-control interfaces. 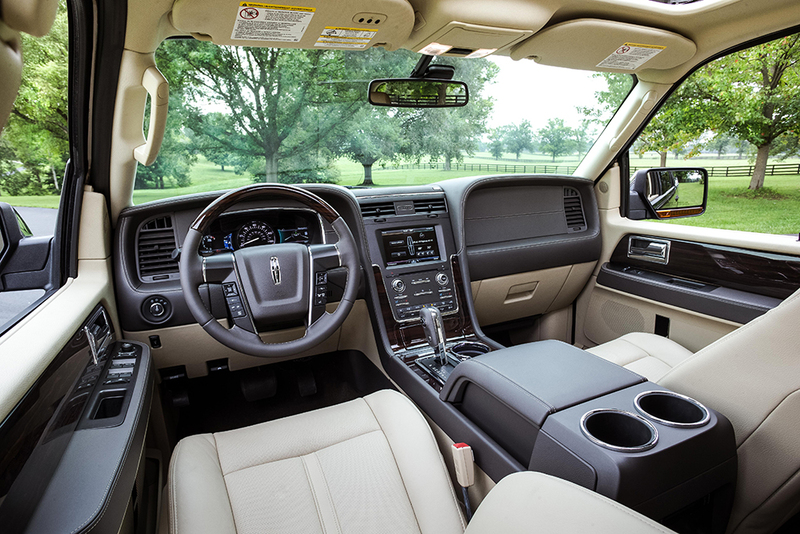 Inside, the feel is warm and pristine, with acres of leather trim and, in upper trims, rich wood accents. A large touchscreen offers access to the Sync connectivity and MyLincoln Touch infotainment and climate-control interfaces. They’ve been much maligned, but these systems continue to improve. This year, a new set of buttons and knobs manage such primary functions as climate control and audio tuning and volume, simplifying their operation. Voice-command technology continues to improve, too, though mastering the system still requires book study. 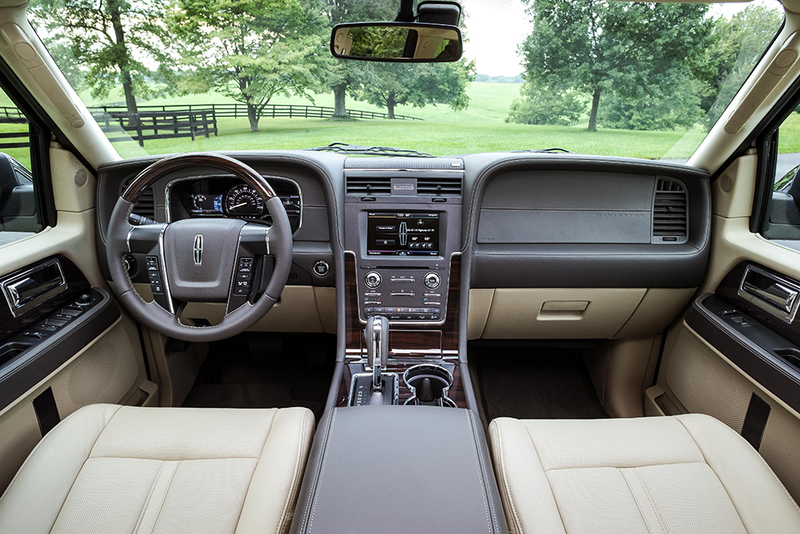 Key options include Lincoln Drive Control, which provides continuously controlled damping and three control modes; and Nivomat, a load-leveling system that raises the back end of a loaded Navigator to optimize ride height for improved handling. A new Reserve Package option includes leather-wrapped instrument panel, armrests and shift knob, Ziricote wood trim (yes, that’s a real thing), premium leather on all three rows of seats and 22-inch polished aluminum wheels. A lighter aluminum-bodied Navigator, based on the new F-150 pickup, is in the works, but won’t be ready until 2017. In the meantime, it’s EcoBoost to the rescue. Options included Lincoln Drive Control; 22-inch polished aluminum wheels; metallic paint.